Looking for an affordable and spectacular way to put the finishing touch to your wedding day? Worried about going over budget with the finishing touches? 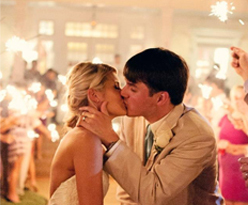 Wedding sparklers could be just what you are looking for. They offer your guests a fun-filled way to help you celebrate your special day and put a new light on the happy couple. What Are Wedding Day Sparklers? While you might not have heard the term wedding sparklers, you would most likely recognize the sparklers used on the 4th of July. Wedding day sparklers are essentially the same and are available all year around instead of only around certain holidays. They come in several different sizes, shapes, and colors, making them the perfect addition to your wedding exit. For example, you could give each of your guests a sparkler and let them create a tunnel of sparkling light for the happy couple to pass through. Before you start thinking that although wedding sparklers sound like a great way to add a magical touch to your day, they have to be expensive, the answer is no. In fact, wedding sparklers bought in bulk quantities are no more expensive than confetti cannons and depending on how many you buy, may cost you less. The trick to saving money is to buy in larger quantities, because the more you buy, the more you save and you can never have too many sparklers for your guests to enjoy. Another way for you to use wedding sparklers to help keep your budget under control, is to consider how and when the sparklers are going to be used. For example, for your wedding exit, you should hand out 36" wedding sparklers since they burn for 3.5 minutes. But if you are planning to place sparklers at each guest's place setting, 10" sparklers that only burn for 45 seconds would be a better plan. Although you may be purchasing the same quantity of each size, by using the shorter burning sparklers instead of the longer burning ones at the right times, you can save even more money. If your wedding is like most, many of your guests will be bringing their kids along with them. Giving the kids sparklers to "play" with under parental supervision can add a touch of fun to a day the average child is likely to get bored with. Providing there is at least one adult supervising the kids, sparklers are safe for children over the age of 5. The sparks that shower down are completely harmless and as long as they are being watched, the kids will remember your special day as being something very special to them as well. Wedding sparklers such as offered at Wedding Sparklers Outlet offer you a very affordable way to add that final touch of magic to your special day. Use them to help illuminate your wedding photos and create amazing memories that will last a lifetime! Visit us online and see our standard and heart-shaped wedding day sparklers selection today!